There seems to be confusion among some younger readers of the book about the “Blow Air” direction in the first exercise. Having played lots of contemporary music with extended techniques required, I may have taken this direction for granted. 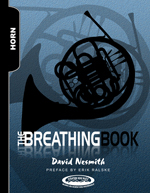 “Blow Air” simply means to form an embouchure, place the mouthpiece on the embouchure as if to play, but just blow air through the lips, into the mouthpiece and through the horn without yielding a horn tone. But during the “Blow Air” note, be thinking the actual pitch. The only thing missing is enough opposition in the embouchure to create a buzz that would actually create a pitched horn tone. Let me know if this doesn’t make complete sense . . .